Today the Board of Supervisors for the University of Louisiana System met in Baton Rouge for its regular Board meeting. Click here to view a video of today’s meeting. 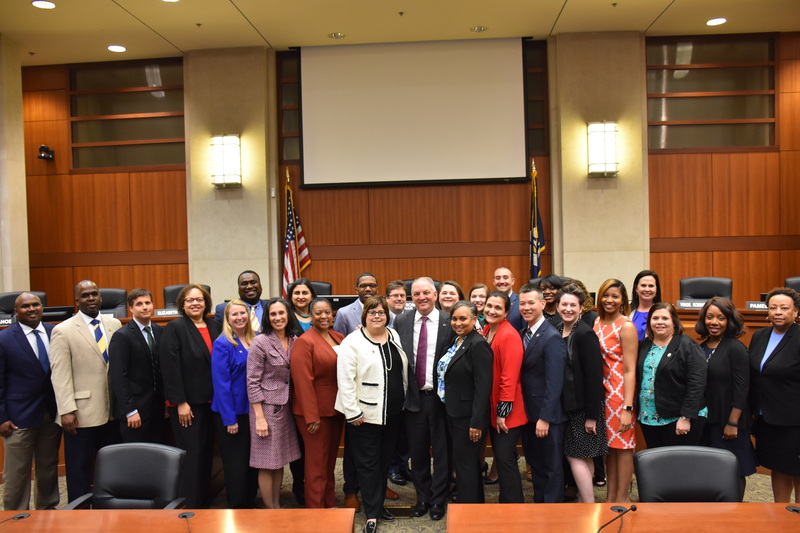 Governor John Bel Edwards visited with the University of Louisiana System board, presidents, and the Management and Leadership Institute. 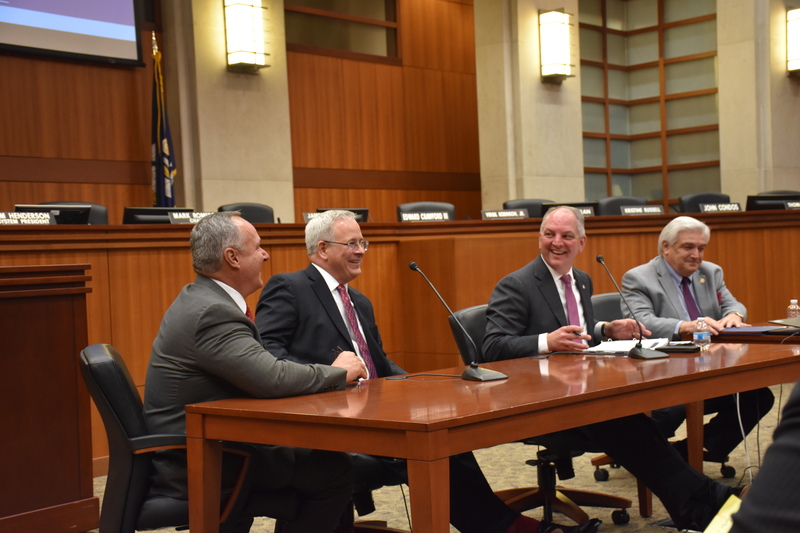 Edwards touted the importance of investing in higher education for the future of Louisiana. 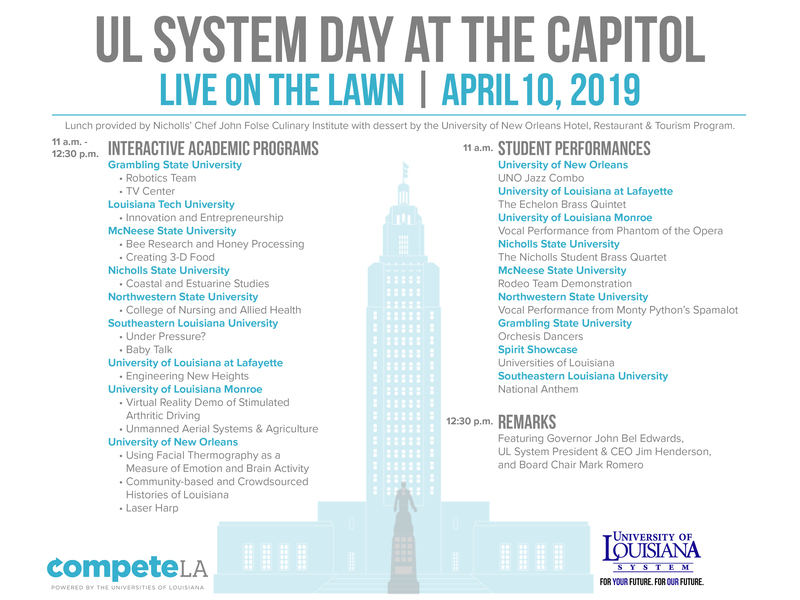 Governor Edwards will address UL System Day at the Capitol tomorrow at 12:30 p.m. Click below for a full list of interactive program displays and student performances. The Board of Supervisors for the University of Louisiana System approved Louisiana Tech’s request to establish the Center for Tissue Engineering and Regenerative Medicine, a cross-institutional endeavor with LSU Health Sciences Center – Shreveport. Through this partnership, researchers will explore the prevention of complications resulting from various diseases such as diabetes, heart disease, and cancer. Beyond UL System Board approval, the partnership requires approval by the LSU Board of Supervisors and the Louisiana Board of Regents. Today’s meeting marks the end of Student Board Member Richard Davis’ term. 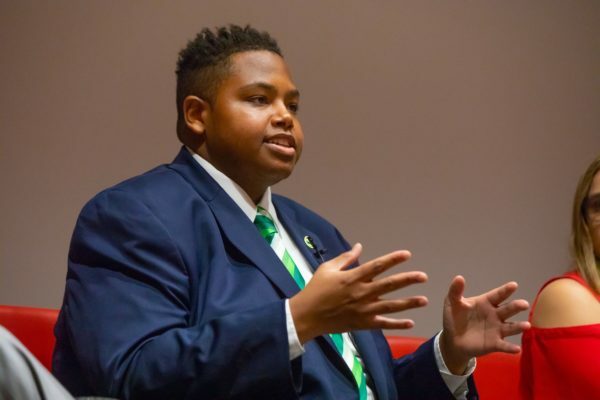 During his service, he participated as a speaker on the student panel at the System conference, played an active role at the recent Board retreat, and spoke powerfully on behalf of the 92,000 students he represents. The Board presented Davis with a memento commemorating his service to the state of Louisiana. 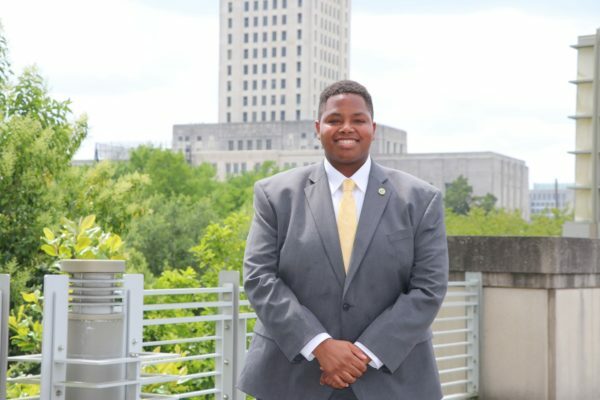 Davis will earn his bachelor’s degree in middle school education in December from Southeastern Louisiana University. The Board of Supervisors for the University of Louisiana System approved UNO’s request to offer six new undergraduate certificates to diversify offerings for students. “These certificates respond to what we are hearing from our business and industry partners regarding competency needs,” UNO President John Nicklow said. Designed to meet demands from workforce and industry, the certificates will allow students the opportunity to gain industry-aligned knowledge and skill sets regardless of major. The undergraduate certificates UNO will offer are Communications and Network Engineering, Corporate and Nonprofit Communication, Data Analytics, Data Engineering, Power and Energy Systems, and Software Engineering. The certificates require approval from Board of Regents. Grambling State University: approval of a Memorandum of Understanding with the University of Alabama at Birmingham. Louisiana Tech University: approval of the Center for TissueEngineering and Regenerative Medicine (CTERM), a cross-institutional endeavor with LSU Health Sciences Center – Shreveport. Nicholls State University: approval to award an Honorary Doctorate of Science to Craig Michael Walker, M.D. at the 2019 Spring Commencement Exercises. Southeastern Louisiana University: approval to award an Honorary Doctorate of Humanities to former Senator Ben Nevers at the 2019 Spring Commencement Exercises. Southeastern Louisiana University: approval to enter into a Memorandum of Understanding and a student exchange program with Jordan University of Science and Technology, Irbid, Jordan. Southeastern Louisiana University: approval of Vision 2025. University of New Orleans: approval of six new Undergraduate Certificates. McNeese State University: approval of a contract with Ms. Kacie Cryer, Head Women’s Basketball Coach, effective April 15, 2019. University of Louisiana at Lafayette: approval of a contract with Mr. LaMar Morgan, Assistant Football Coach, effective February 22, 2019. Louisiana Tech University: approval to demolish Harper Hall. Louisiana Tech University: approval to demolish Harris Hall. Louisiana Tech University: approval of a Cooperative Endeavor Agreement with Caddo Parish School Board to expand educational and research offerings of the University and School District and allow the Caddo Parish School District to lease the Louisiana Tech University Shreveport Center pursuant to the authority vested in La. R.S. 17:3361. McNeese State University: approval to demolish the Football Service Building at the Athletic Campus. University of Louisiana at Monroe: approval to split the Tom & Mayme Scott Endowed Chair in Clinical Pharmacy Practice into two Endowed Chairs: (1) Tom & Mayme Scott Endowed Chair in Clinical Pharmacy Practice and (2) Tom & Mayme Scott Endowed Chair for Excellence in Pharmacy. University of New Orleans: approval of a Cooperative Endeavor Agreement with InnoGenomics Technologies. University of Louisiana System: approval of Campus Housing and Meal Plan Rates, Auxiliary Rates, Energy Surcharge, HB 152, and Non-Governmental Charges for Academic Year 2019-20. Grambling State University: approval to appoint Dr. Connie Walton as Interim Provost/Vice President for Academic Affairs effective May 11, 2019. McNeese State University: approval to appoint Dr. Angelique Ogea as Dean for the Burton College of Education effective April 1, 2019. 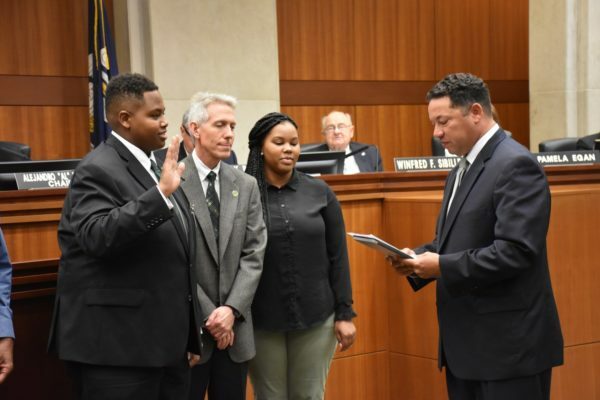 Southeastern Louisiana University: approval to appoint Dr. Gabriel Willis as Dean of Students effective April 1, 2019.